A masterpiece of mood...Donnie Darko is made less obscure—for better or worse—in Kelly's expanded director's cut. In 2001, Richard Kelly unleashed Donnie Darko, a curious excursion through '80s teen culture with ominous science-fiction overtones. Critics were divided, if not baffled, by this surreal meeting of time travel and tragic suburban destiny, but the film quickly amassed a cult audience among young hipsters, genre buffs, and conossieurs of weird cinema. In the meantime, the young star of Donnie Darko, Jake Gyllenhaal, catapulted into the top ranks of young Hollywood while Kelly has struggled valiantly to get his sophomore effort off the ground. Now, Newmarket Films—in anticipation of a DVD re-release—has put Donnie Darko back into theatres or, as Rod Serling might say, submitted it for your approval. The Twilight Zone-esque tale unfolds at a deliberate pace but never loosens its hold on the viewer. Gyllenhaal plays the surly title character, a neurotic teen having an on-again, off-again relationship with the medication prescribed by his psychoanalyst. As if things aren't strained enough in the Darko home (also populated by mother Mary McDonnell, father Holmes Osborne, and sister Maggie Gyllenhaal), a jet engine screams out of the sky and into Donnie's bedroom. Fortune spares Donnie on that morning of October 2, 1988. His reprieve is little consolation, however, as a man in a giant bunny costume appears to him and promises the end of the world in less than a month, on Halloween night. Donnie Darko is a masterpiece of mood, with sedated observation of the absurdities subjected on the characters, from the Bush-Dukakis election to the self-help twaddle about "attitudinal beliefs" espoused by local celebrity Jim Cunningham (Patrick Swayze). Many films try to fill themselves with quirks, but Kelly's have a conviction which feels genuine, which makes them darkly funny. That conviction also makes possible the fearful loss of faith in so-called reality which makes time travel and apocalypse sound credible. Most importantly, Donnie is a believable character: never a conventional hero, but a kid trying to work it all out. Donnie Darko is made less obscure—for better or worse—in Kelly's expanded director's cut. The challenging 2001 cut leaves more to the imagination; the 2004 cut plays more like The Sixth Sense, a tonal emotional thriller with a twist. Scenes fleshing out character relationships are heartfelt and welcome (like a newly added scene between Donnie and his father, and another showing Drew Barrymore's put-upon English teacher reluctantly replacing Graham Greene's The Destructors with Watership Down); new transitional passages delineating some time-travel concepts from Roberta Sparrow's book may spell out too much, though they bring the narrative into focus. In either configuration, Donnie Darko remains a vivid experience. Donnie Darko's Blu-ray debut comes in a deluxe two-disc package that offers both the Theatrical Version (113m) and Director's Cut (134m). High-definition offers an improvement over the previous DVD releases; the image isn't perfection (the source material is somewhat limiting), but it'll most likely never look better than this. The image has accurate color and solid detail, with a few specks here and there; proof that the transfer is doing its best with the image comes during the special effects sequences, which prove a bit more sharp and vivid than the relatively soft production photography. A DTS HD-MA 5.1 track is likewise a definitive offering for this film, with some dimensionality but nothing too spectacular in keeping with the film's low-budget roots. Three commentary tracks are included. Writer/director Richard Kelly sits with Kevin Smith for the rollicking, profanity-laden Director's Cut commentary. Kelly and Jake Gyllenhaal share a track on the Theatrical Version, and the Theatrical Version also gets a commentary with Kelly, producer/actor Drew Barrymore, Jena Malone, producers Sean McKittrick and Nancy Juvonen, Mary McDonnell, Beth Grant, Holmes Osborne, Katherine Ross, and James Duvall. The second disc is the second DVD from the two-disc Director's Cut DVD special edition. 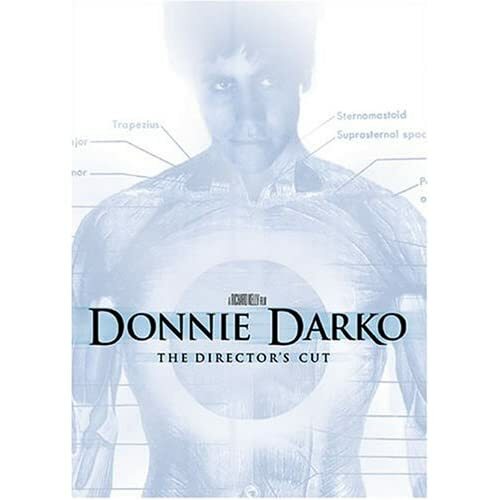 The disc includes the "Donnie Darko Production Diary" (52:51, SD), an assembly of raw footage of location scouting and production. The fascinating behind-the-scenes chunks include such captured moments as Drew Barrymore pitching Kelly an '80s dance she's prepared for one scene. This feature comes with optional commentary by director of photography Steven Poster. "They Made Me Do It Too: The Cult of Donnie Darko" (28:03, SD) features effusive British fans. "Storyboard to Screen" (7:58, SD) is a top-bottom comparison of the storyboards to four finished scenes. "#1 Fan: A Darkomentary" (13:17, SD) is the winner of an online documentary competition sponsored by Fox Home Video. Last up is the "Theatrical Trailer" (1:02, SD). All site content © 2000-2019 Peter Canavese. Page generated at 04/24/2019 07:13:53AM.